Passengers purchased tickets at South Station Tuesday for Fung Wah’s afternoon trip to New York. But soon Kakulu and other loyal customers may have to find a different ride, as Fung Wah — which virtually invented cut-rate, no-frills bus service between Boston and New York — may be facing too many troubles to keep operating. Late Tuesday night, Fung Wah posted a sign at its South Station berth saying service was being suspended for bus repairs. That came just hours after the bus line was told that it is in danger of being kicked out of South Station. On Tuesday, Massachusetts transportation officials sent Fung Wah a “cease and desist order” preventing it from operating out of its docks at South Station as long as the company’s own fleet of buses is grounded. Federal regulators had ordered Fung Wah to remove all 28 of its buses from service earlier this week after inspectors found cracks in the frames of some of the vehicles. Fung Wah had been continuing to run passenger service out of South Station using buses chartered from other carriers. MBTA spokesman Joseph Pesaturo said Fung Wah ran another bus out of South Station after receiving the cease and desist notice. “And if they continue to operate service, we will have to consider what steps to take next,” Pesaturo said. 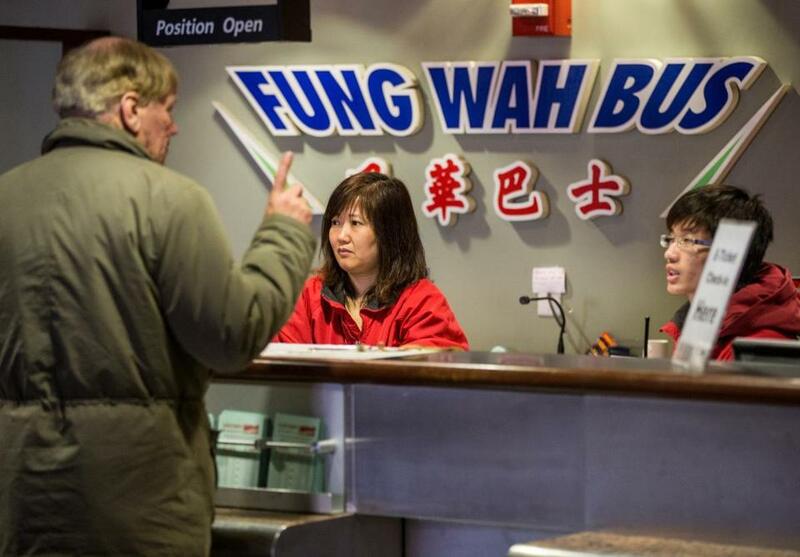 The real estate firm that manages South Station for the MBTA said the review of Fung Wah’s lease at the bus terminal was triggered by the fleet grounding, and the sudden influx of new charter buses to Fung Wah’s service. “We are concerned about the safety of the passengers, and we know that the buses that are in the building are inspected all the time, but we don’t know if charter companies they are using have any inspections,” said South Station general manager Stephen Squibb. Squibb said the other companies that offer service to New York City — including Megabus, BoltBus, and Lucky Star — are making contingency plans to pick up Fung Wah riders. Earlier Tuesday, the Federal Motor Carrier Safety Administration grounded the remaining seven buses in Fung Wah’s fleet, just one day after Massachusetts regulators requested that three-quarters of those buses be pulled off the road because of cracks found in the frames of some of the vehicles. A spokesman for the US Motor Carrier agency, Duane DeBruyne, said investigators would inspect Fung Wah buses for safety issues but offered no timeline for when the company’s vehicles would return to service. The US government has increased efforts to crack down on potentially negligent transportation companies following recent high-profile fatal motorcoach accidents in Oregon and California. Since ushering in the era of frequent trips between Boston and New York at super-low fares, Fung Wah has had a checkered operating record. Its buses have been cited for 159 maintenance violations in the past two years, including 23 instances of cracked, loose, or broken frames, according to the Federal Motor Carrier Safety Administration. Last month, one of its buses hit two pedestrians in Manhattan, according to news reports. In 2007, a Fung Wah bus crashed into a guardrail at the Allston-Brighton tolls, another rolled while rounding an interstate ramp in 2006, slightly injuring 34 passengers, while in 2005 a Fung Wah bus caught fire on a highway in Connecticut. Meanwhile, the Boston-New York travel corridor has become more crowded with BoltBus and Megabus lines now competing against Fung Wah. Still, the carrier has its loyal patrons, including those who forked over $15 Tuesday for a one-way trip to New York City. At the neighboring Lucky Star dock at South Station, 20-year-old Kingsley Tan of Boston was waiting to board the bus to New York. The St. John’s University student said despite its reputation he never had a problem riding Fung Wah. Casey Ross of the Globe staff contributed to this report. Taryn Luna can be reached at taryn.luna@globe.com. Alyssa Edes can be reached at alyssa.edes@globe.com.